The advanced hardware is combined with completely integrated, powerful software for scanning and inspection, intensive hard- and software training and reliable worldwide support network to form a complete package at a competitive price. New applications, e.g. measurements in narrow spaces, interiors etc. The ATOS Software is a knowledge base – it guides the operator through the complete scanning procedure and provides support for setting up new measuring tasks using guided project creation. The ATOS software is used to run the sensor head, to process the 3D point cloud and to edit and post-process the data. The simple graphical user interface helps support today's demanding tasks in quality control, manufacturing processes and reverse engineering. GOM Inspect is the free result viewer, mesh processing and inspection software for dimensional analysis of ATOS data or 3D point clouds. GOM Inspect is more than just a viewer. It also contains a complete set of tools for advanced mesh processing and evaluation. 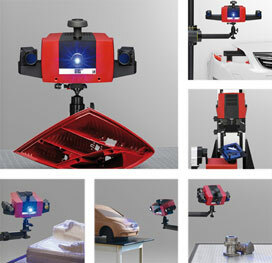 This free software not only analyzes ATOS data, but also 3D point clouds from laser scanners, CTs, and other white light scanners. Import, process, and evaluate in one free software package. Share ATOS results, further analyze data and easily discuss and detect problematic areas with colleagues, suppliers, and customers for effective collaboration to speed-up decision making processes.